When I was at the University of California at Davis for the Civic Leadership Forum: A Filipino Community Policy Symposium in September, I met Miguel Bryan Juteau, a design student attending Berkeley City College (BCC) who was going to be attending Davis next fall. 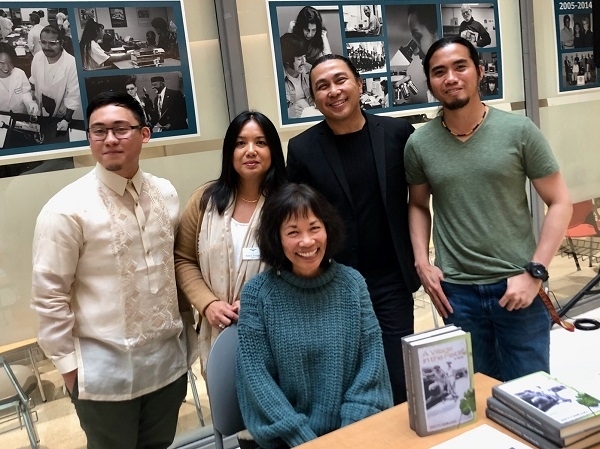 I was away from my book display when he happened to walk by and told Abe Ignacio, librarian for the Filipino collection at the San Francisco Public Library and whose table I was sharing, that he had recently gotten my book. Abe let him know that I was here and that he could talk to me about the book. It was a serendipitous moment for the both of us. From that pleasant meeting, Miguel let me know that he is president of the Filipino Students Alliance at BCC and he was planning Filipino-American History Month noon-time events in October. 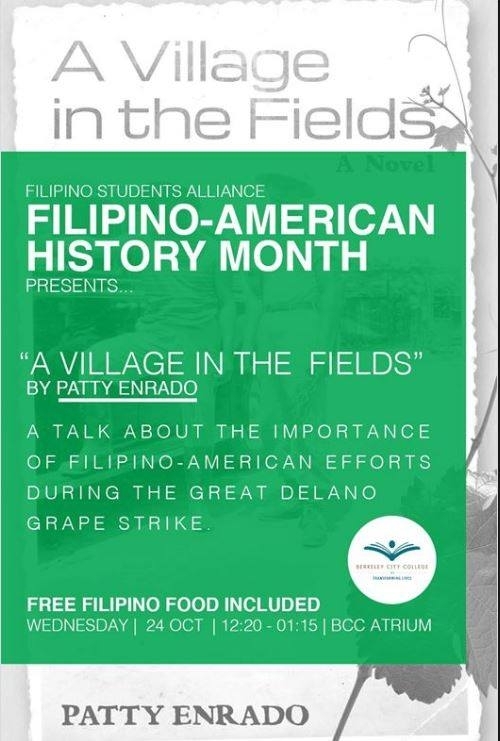 Would I be interested in talking about my book and Filipino-American contributions to the farm labor movement, he wanted to know. Absolutely. 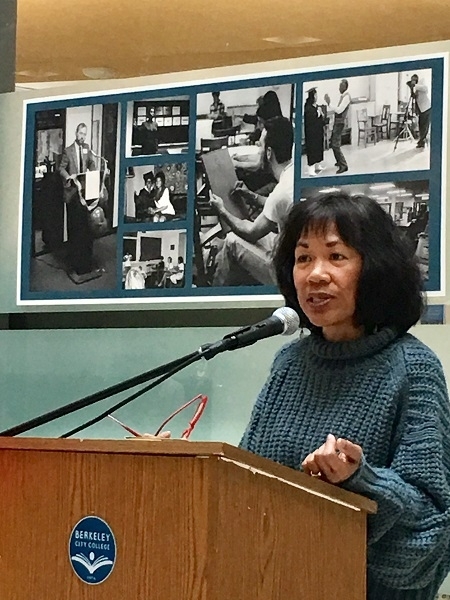 So on Wednesday, October 24th, the day before labor leader Larry Itliong’s birthday, I gave short reading from A Village in the Fields, and then talked about the importance of getting history rightfully recorded, little-known facts about the Great Delano Grape Strike and boycott, and, speaking to my passion, the importance of Ethnic Studies. I also did a short Q&A. The poster that Miguel created for the event. 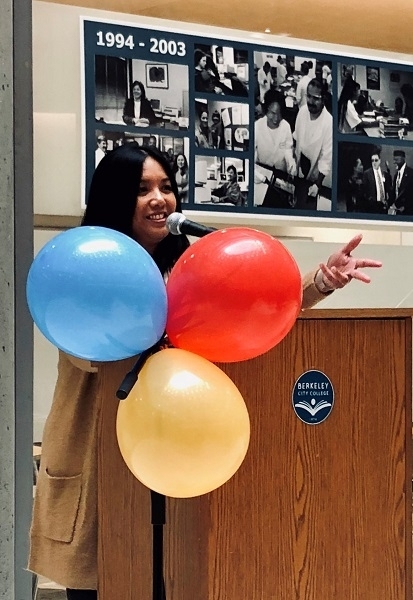 I’ve never been to BCC, so when Miguel told me that the event would be in the atrium, in the basement, I had visions of a small room in a basement, forgetting the definition of atrium! When I walked downstairs, I came upon a light-filled (atrium!) open area that had several rows of chairs facing a podium. When I looked up, I could see the several floors above, and the ability for people to peer over and be a part of the event. 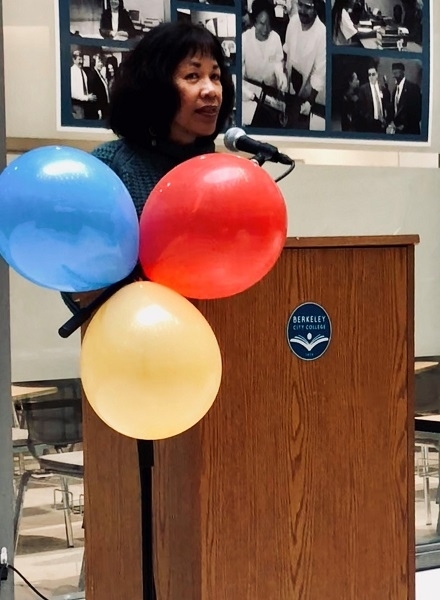 BCC President Dr. Rowena Tomaneng gives a warm welcome to this Fil-Am History Month event (photo courtesy of Felicia Layser Robertson). BCC President Dr. Rowena Tomaneng gave a warm welcome and introduction. It was so nice to see the seats filled with faculty and engaged students. And in a heartwarming move, Felicia Layser Robertson saw my event post on Facebook and sent out an email to our fellow ECHS Gaucho moms from baseball to join her. So Felicia, Yoko Morita, Estella Sloan, and Kelly Whitney were in attendance, which was really nice. I read a short passage from my novel, about the first day of the Great Delano Grape Strike (photo courtesy of Felicia Layser Robertson). Talking about the importance of Ethnic Studies is a passion of mine. I didn’t hold back today (photo courtesy of Dr. Rowena Tomaneng). Maraming salamat, Miguel and Dr. Tomaneng! Happy Filipino-American History Month! So grateful for the support of BCC folks for this event: (left to right, Miguel Juteau, President of BCC’s Filipino Student Alliance, in his barong Tagalog; Dr. Rowena M. Tomaneng, President of BCC; Jason Cifra, Peralta Colleges Vice Chancellor of Student Services; and Jeejun Bertuso, Student Services Staff. 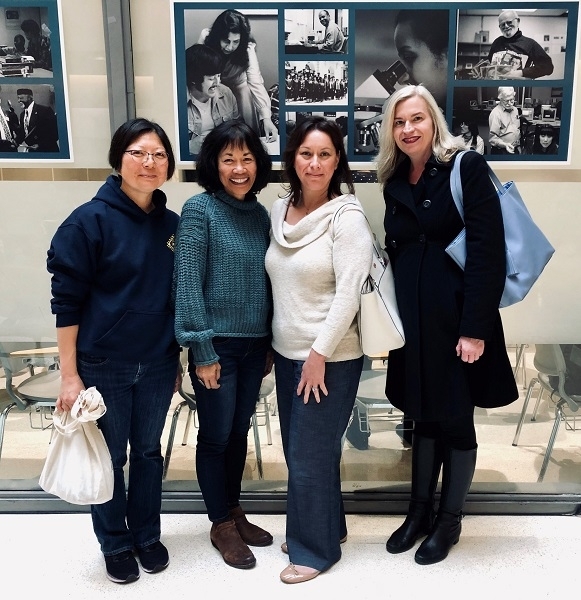 We’re missing Kelly in this photo, but it was touching for me to have had my El Cerrito High School Gaucho baseball moms at my reading and talk (photo courtesy of Felicia Layser Robertson).